The System Usability Scale (SUS) is the most used questionnaire to measure perceptions of usability. It was developed 30 years ago by John Brooke. I had the fortune to meet with John in person last month in London. We talked about his motivation and process for creating the now famous “quick and dirty” questionnaire. John wanted more than a list of issues from the usability tests he was conducting; he also wanted a quantitative measure of how the experience was for participants. Other questionnaires he considered were too long (30+ items); he wanted something that could be completed quickly. He picked up a book on psychometrics, collected some data, and the SUS was born. The SUS of course shouldn’t be the only instrument you consider when measuring the user experience. For websites, the SUPR-Q is a better instrument. The SUS is also not a substitute for measures of loyalty or satisfaction (although it is highly correlated with these constructs). The SUS’s wide adoption and good psychometric properties though means it’s a good instrument to start measuring with. Here are five uses of the System Usability Scale. This was why the SUS was originally developed. After participants attempt to complete tasks in an interface, have them answer the 10-item SUS. It’s usually best to administer it electronically and double-check participants’ responses[pdf]. 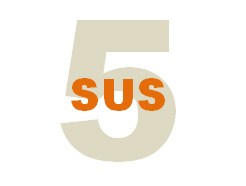 With the wide use of the SUS, you can use the known benchmarks; for example, a SUS score of 68 is about average across our 500-product database. For consumer software, an average score is 72. While its original intent was to be used after observing users attempt tasks in usability tests, like many instruments, it has uses beyond the usability lab. You can use the SUS as a stand-alone survey to measure the “pulse” of users’ usability attitudes. It can be collected once or on a regular basis. In the same survey you can also measure other company KPIs, like satisfaction and loyalty. This allows you to both assess perceptions of usability as well as to understand their association to other key company metrics. Keep in mind the SUS isn’t meant to be diagnostic, so survey responses are unlikely to tell you what to fix in the software (although asking participants to report their top problems is surprisingly effective). And again if you’re measuring websites, I recommend the SUPR-Q as you get a SUS-equivalent score, as well as scores on appearance, trust, and loyalty in 8 items. Your interface doesn’t have to be fully functioning to use the SUS. You can administer the SUS even with moderately functioning prototypes. Keep in mind that the benchmark data we have for the SUS is on functioning products, not prototypes. But you can still use the SUS to assess the early indications of usability, and—most importantly—compare the changes in the SUS as you make changes to the prototype and to the final working interface. This can be especially helpful if your organization develops a lot of products; you can compare the SUS scores at each phase of development to other products tested. For example, you can see how well your prototype SUS score compares to other prototypes at the same level of development. Many products, especially those in the B2B enterprise space, can be quite complex. For example, accounting, HR, and CRM software have a lot of disparate functions with often vastly different users. You can use the SUS to assess just a portion of the functionality and not the entire product. How focused you make it depends on your needs, but in general it should be a cohesive set of functions (such as an “onboarding” function of an HR application). But you don’t want to use the SUS after each task; for that use the SEQ. One of the advantages of the SUS is that its technology agnostic. That means you can use it on anything with an interface. Even though nothing like mobile applications (or smartphones or even the Web) existed when the SUS was developed, it’s still a valid and reliable instrument for the latest technology. You can collect SUS data on green screen terminals (what John Brooke used it for), hardware devices (mobile phones, headphones, ATMs), software (QuickBooks, Excel), and mobile apps (Facebook, Waze, Clash of Clans). It was good getting to meet John, discussing the impact of the SUS, its influence on the field, and even English politics (such as Act of Unions in 1707). John is now retired and spends his time writing short stories. While the field of user experience is unlikely to see any new publications from him, I suspect we’ll still be talking about his legacy, the SUS, in another 30 years.